As the face ages, skin loses collagen and facial fat pads diminish and migrate, causing sagging and wrinkles. Dermal fillers can be used to plump up areas of the skin and fat helping restore appearance. 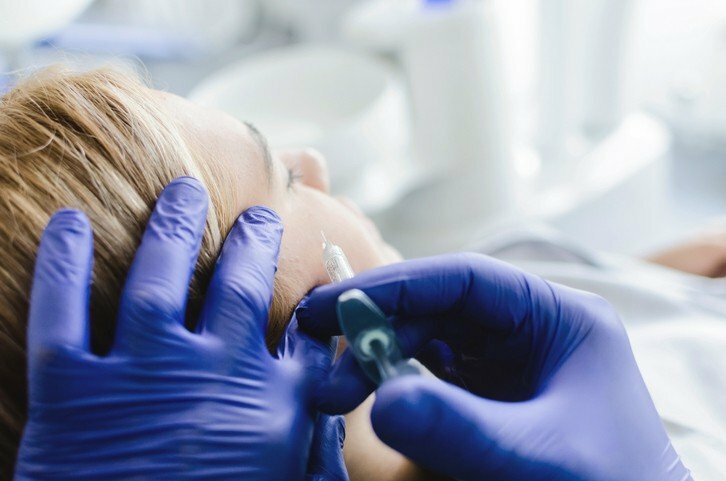 Having dermal fillers is an increasingly popular cosmetic procedure, with more people than ever choosing to use a growing range of different filler substances. For instance, products including Restylane, Juvederm and Belotero are some of the main types of fillers, having largely replaced collagen for facial line smoothening and lip augmentation. These fillers are non-animal based clear gels that are almost identical to a naturally occurring substance in the body called hyaluronic acid. They work with the body’s own hyaluronic acid to smooth, fill and plump out lines and instantly enhance lips. Present in all living organisms, hyaluronic acid has already been used widely in general medicine to help eye surgeons perform cataract operations, and for injection into arthritic joints to aid mobility. In your skin it creates volume, resulting in a healthy and vital appearance. However, the final result you can achieve depends on the type of filler you use and the problem you want treated. Dermal fillers integrate with skin tissue and allow the free passage of vital elements including oxygen and hormones, resulting in healthy, natural-looking skin. Over time they are broken down by normal biological processes and removed from the body. No long-term problems have been recorded. What can demal fillers be used for? Filling acne and other scars Fillers can also be used in the upper part of the face to treat expression lines – for instance, crow’s feet or forehead lines. Will dermal fillers work for me? Some of the results can be seen immediately such as Voluma and Sub Q. If botox is used this can take 3-7 days to take full effect. The period of benefit from this treatment varies between individuals and depends on factors such as your age, skin type and lifestyle. How do you chose which one to use? The biggest difference between the various fillers available is the size of the particles used, the active ingredient and the quantity in each vial. For instance, we would suggest fillers with smaller particles for superficial lines and larger particle fillers for deeper wrinkles, restoring lost volume, skin folds and lips. To find out which filler is best for you, contact us for a complimentary consultation. At your first visit, you will have a detailed discussion with a medical practitioner about your expectations, the possible side effects, complications, what the treatment involves, pain control and aftercare. We will also take your medical history, to make sure there is no reason why you should not receive the treatment. In addition, you will be asked to sign a consent form and we may also take photographs of you. Fillers are injected into the the skin using a very fine needle or under the skin. Juvederm and Restylane both contain Lidocaine, any discomfort is, therefore, minimal. For lip treatments, we can use an anaesthetic nerve block – which is similar to having a dental injection. Treatments take from 20 to 30 minutes, and results are instant. This largely depends on the structure of the skin, lifestyle, age and the degree of perfection demanded by each individual patient. You can have additional touch-up treatments any time after your first treatment, However, generally speaking, to maintain the results you have achieved you’ll need a follow-up treatment after six to nine months for lines, wrinkles and folds, and after six months for lips. Some injection-related reactions occasionally occur, such as transient redness, swelling, pain, itching and tenderness at the injection site. However, these resolve themselves after a day or two for wrinkle treatments, and after a few more days for lips treatments. Other types of reactions are very uncommon, with just one in 15,000 people experiencing hypersensitivity reactions after having hyaluronic fillers. Are dermal fillers suitable for you? As with any treatment involving the skin, injections should be avoided in areas where there is any swelling or infection. Dermal fillers have not, however, been tested in pregnant or breastfeeding women, and are therefore not advised. Meanwhile, if you have a history of cold sores in the area to be treated, we may recommend that you take anti-herpes medicine before your treatment to help reduce the likelihood of an outbreak.